Particularly when travelling, one is constantly in contact with objects that are used by a lot of people. 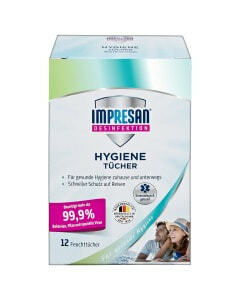 With the IMPRESAN On-the-Go Hygiene Spray, you can disinfect surfaces and textiles quickly, reliably, and efficiently. It removes more than 99.9 per cent of specific bacteria, fungi, and viruses. Enjoy being on the road without having to worry about germs. With the IMPRESAN On-the-Go Hygiene Spray, you can disinfect surfaces and textiles safely and thoroughly, such as objects, toilet seats, headrests, or armrests. It is dermatologically tested. The Hygiene Spray eliminates more than 99.9 per cent of specific bacteria, fungi, and viruses*, which can cause diarrhoea, measles, mumps, or influenza, among other things. of specific bacteria, fungi, and viruses*, which can cause influenza, pneumonia, or diarrhoeal diseases. It makes travelling even more fun. From the motorway station toilet to the rental car, this spray ensures healthy hygiene. The little spray bottle fits into any handbag and disinfects quickly and reliably.